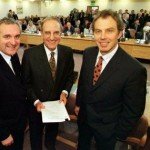 The Good Friday Agreement – or the Belfast Agreement as it is formally known – was arguably the most significant development in the Northern Ireland peace process. It was signed in Belfast on April 10th 1998 by representatives of Britain, the Republic of Ireland and most Northern Ireland political parties. This followed months of formal talks, preceded by more informal dialogue and negotiation. The Good Friday Agreement sought to establish peace and stability in Northern Ireland through three strands: a power-sharing government in Belfast, cooperation between Northern Ireland and the Republic, and cooperation between the Republic and Britain. The agreement also sought to end sectarian violence by addressing three critical issues: the decommissioning of paramilitary weapons, early release for prisoners and reforms to policing and security in Northern Ireland. The Good Friday Agreement was hailed around the world as a major step towards peace in Northern Ireland. Not all parties accepted it, however, and its implementation would prove difficult. The Good Friday Agreement was one of several attempts to broker peace in Northern Ireland. Some of the developments that preceded and influenced it include the Sunningdale Agreement (1973), the Anglo-Irish Agreement (1985) and the Downing Street Declaration (1993). The Provisional IRA‘s August 1994 ceasefire, followed soon after by a ceasefire among Loyalist groups, was also an important factor. The willingness of paramilitary groups to lay down their arms created an opportunity for talks involving all stakeholders. In its early phase, the peace process was managed by the governments of Britain and the Republic of Ireland. In February 1995 London and Dublin released two frameworks documents, outlining suggested terms for a peace agreement and the formation of accountable government in Northern Ireland. Behind the scenes, negotiators worked with the Provisional IRA and other paramilitary groups to reach agreement on weapons decommissioning. The peace process was aided by greater involvement from United States. US administrations of the 1970s and 1980s generally ignored the sectarian problems in Northern Ireland. They considered the Troubles an internal problem for Britain and were loath to intervene in the domestic affairs of a major ally. This changed with the election of Bill Clinton in November 1992. Early in his presidency Clinton was lobbied by influential Irish-Americans, concerned Congressmen and Irish taoiseach Albert Reynolds; all urged him to contribute more actively to the Northern Ireland peace process. 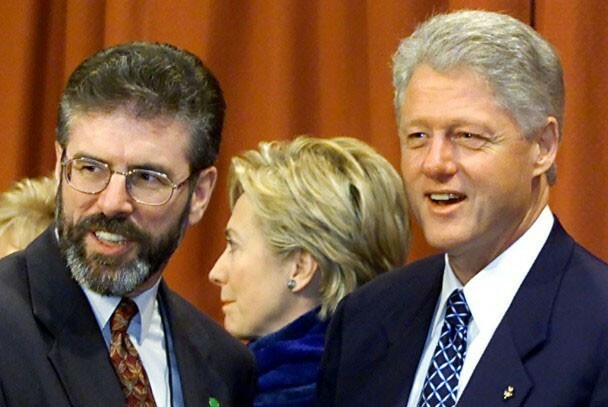 In January 1994 Clinton, acting against British diplomatic advice, granted Sinn Fein leader Gerry Adams a 48-hour visa to visit New York City. The following January Clinton created a new diplomatic position, Special Envoy for Northern Ireland, and appointed retired senator George Mitchell to the role. 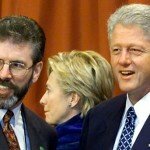 Adams returned to the US in March 1995 and Clinton shook his hand at a St Patrick’s Day event in Washington DC. These events marked a significant shift in US policy but did not sit well with many in Britain, including prime minister John Major. In November 1995 London and Dublin issued a communiqué outlining a ‘twin track’ process for peace talks and arms decommissioning. In January an international commission headed by George Mitchell delivered a report suggesting guidelines for decommissioning. Mitchell’s report also suggested a set of six principles that should underpin peace talks. The Mitchell Principles, as they became known, were adopted as a basis for subsequent negotiations. Most of Northern Ireland’s political parties lined up to participate in peace talks, including the Ulster Unionist Party (UUP), Sinn Fein, the Social Democratic and Labour Party (SDLP), the Alliance Party, the Loyalist-aligned Ulster Democratic Party (UDP) and the Labour Coalition. Unionists refused to participate in peace talks, however, without clear evidence that the IRA had begun decommissioning its weapons. Major’s government, now reliant on Unionist votes in the House of Commons, also insisted on evidence before Sinn Fein would be welcomed into peace talks. On February 9th 1996 outraged Provisional IRA leaders formally ended their August 1994 ceasefire. Later that day the IRA reactivated its mainland campaign, detonating a truck bomb in the London Docklands. The explosion killed two people, injured dozens more and caused considerable property damage. 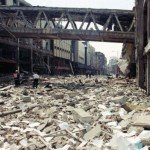 On June 15th a similar bomb exploded in Manchester, injuring more than 200 people and causing extensive damage to a commercial precinct. 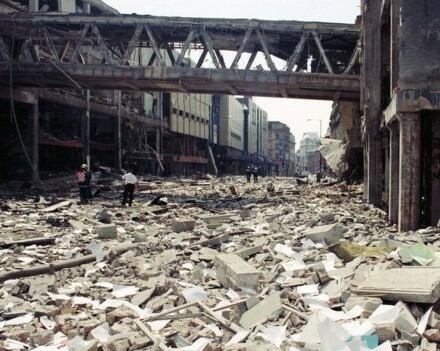 The IRA carried out dozens of smaller attacks over the coming year, before declaring a second ceasefire on July 19th 1997. In September Sinn Fein was accepted into the peace talks after agreeing to abide by the Mitchell Principles. Moderate Unionists also joined the peace talks, though they were boycotted by Ian Paisley and the Democratic Unionist Party (DUP). The talks began at Stormont in mid-September and moved to London’s Lancaster House four months later. Violence in the first months of 1998 threatened to undermine and derail the peace talks. In late December 1997 Loyalist leader Billy Wright was shot dead by Irish National Liberation Army (INLA) volunteers inside HM Prison Maze. Despite the efforts of Mo Mowlam, who visited the Maze to placate Loyalist paramilitary volunteers, Wright’s murder unleashed a wave of retaliatory killings in Belfast and Derry. On February 9th a Catholic man was shot outside a Belfast police station. The following day an Ulster Defence Association (UDA) member was assassinated by the IRA in Dunmurry. A month later Loyalist volunteers shot dead Damian Trainor and Philip Allen, two men drinking together in a bar in County Armagh. Trainor was Catholic and Allen Protestant; the two were friends and had no affiliation with any paramilitary group. The murder of two civilians who had bridged the sectarian divide captured the attention of the press. The Independent noted that Trainor and Allen would be buried in different cemeteries – but as victims of indiscriminate violence would never be far apart. These incidents, as well as occasional attacks by ultra-Republican groups the Real IRA and Continuity IRA, failed to halt the talks – though both the UDP and Sinn Fein sat out temporary exclusions due to ongoing violence in Belfast. 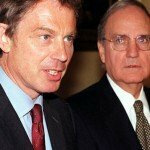 Mitchell’s chairmanship kept the talks proceeding, as did Tony Blair’s decision to convene a second inquiry into Bloody Sunday and telephone discussions between Bill Clinton and key participants. On April 9th, as the talks exceeded their midnight deadline, UUP delegate Jeffrey Donaldson walked out over disputes about decommissioning. 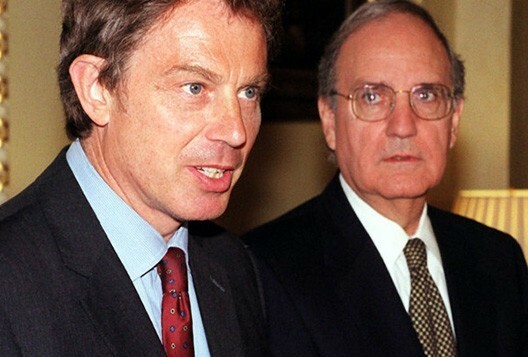 The following afternoon, April 10th, George Mitchell announced to the media that a final agreement had been reached. Strand One dealt with government and political institutions in the Six Counties. It re-formed the Northern Ireland Assembly and created a new Northern Ireland Executive. The Assembly would be elected with a system of proportional representation. Once established it would be given devolved powers by the British parliament. The Executive would be based on power-sharing principles. It would be led by a First Minister and Deputy First Minister which, despite their titles, would share equal power. The First Ministers would come from Unionist and Nationalist parties and required the support of the general public. Strand Two addressed “North-South issues” between Northern Ireland and the Republic of Ireland. It created three cross-border bodies: a North-South Ministerial Council, a North-South Inter-Parliamentary Association and a North-South Consultative Forum. These bodies would encourage discussion and cooperation between Belfast and Dublin. While these bodies had no law-making power, their recommendations were expected to be adopted by both government. Strand Three was concerned with “East-West issues” between Great Britain and the Republic of Ireland. It also established three cross-border bodies: an Inter-Governmental conference, an Inter-Parliamentary Body and a British-Irish Council. These bodies would discuss matters not devolved to Northern Ireland and establish common policies or approaches. As well as political reforms, the Good Friday Agreement provided practical measures for ending sectarian violence in Northern Ireland. It required signatories to “reaffirm their commitment to the total disarmament of all paramilitary organisations”. Parties with links to armed groups were urged to work towards the decommissioning of “all paramilitary arms within two years”. The agreement identified a pressing need to reform policing in Northern Ireland; an independent review would be conducted to oversee this. Lastly, the agreement promised early release for prisoners serving time for Troubles-related offences. Early releases would be dependent on paramilitary groups maintaining their ceasefire and upholding their commitment to decommissioning. These contentious issues – arms decommissioning, policing and prisoner releases – would fuel public debate and create problems in post-Good Friday Northern Ireland. 1. 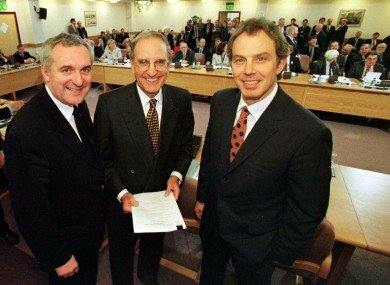 The Good Friday Agreement was a peace deal signed by the governments of Britain and Ireland, as well as most Northern Ireland political parties, in April 1998. 2. The origins of the agreement can be traced back to the 1994 Provisional IRA ceasefire, collaboration between London and Dublin, as well as greater involvement by the US. 3. The Mitchell Principles served a basis for peace talks while earlier agreements, such as Sunningdale and the Anglo-Irish Agreement, provided models for a peace deal. 4. The agreement contained three strands: a new Northern Ireland Assembly and Executive based on power-sharing, as well as two groups of cross-border institutions. 5. The agreement also sought to end sectarian violence by requiring full decommissioning of weapons, in return for early prisoner releases and reforms to policing. R. Poole and S. Thompson, “The Good Friday Agreement”, Alpha History, accessed [today’s date], https://alphahistory.com/northernireland/good-friday-agreement/.